St. John's welcomes all people to participate in the full life of the community of faith. We offer new member & inquirer classes quarterly for folks who are interested in joining, or simply in learning more about our church. Click through to the Membership page for more info about what church membership means, scheduling of classes, and to sign up to attend. The purpose of St. John’s UCC is to glorify God in thought, word, and deed. To demonstrate the love of Christ in our community by welcoming and befriending all, encouraging spiritual growth, and trusting and sharing God’s grace. Guided by the Holy Spirit,to be a vibrant, diverse, and dynamic community of Christian faith, known for our wide welcome, thoughtful faith, resilient hope, and extravagant love. Our Current Bylaws can be read here. St. John's is a congregational church, meaning that short of the Leadership of Christ, our primary leadership is exercised by church members. The church is governed by a tricameral consistory of elected elders, trustees, and congregational life, and is guided in its spiritual life and mission by an ordained minister. St. John's also employs a small staff of administrative professionals and musicians. Click through for more details and contact information for our Leadership. St. John's Church was organized as a German Evangelical congregation in Woodland, CA in the year 1891. In 1934 the original sanctuary burned down in a fire, which started in a nearby brewery. Within a year, even in the midst of the Great Depression, funds were raised and the sanctuary was rebuilt (using brick this time around). The new sanctuary was completed in 1935, and is still our functioning sanctuary today. 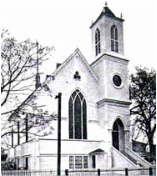 When the United Church of Christ (UCC) was formed in 1957 by the unifying of four different denominations, including the German Evangelical Church, St. John's became a congregation of the UCC, the denomination to which it still belongs. For a more detailed history of the church, click through to the History page.